Before we loaded up the MR2 for the first leg of our journey south, Jen wanted to take part in the Perth park run, a timed 5km race around the North Inch park, next to the River Tay. I went along to watch, and Jen put in a decent time. After all that running (and watching) a treat was required, so our first stop was at S Luca’s ice cream parlour in Musselburgh- a favourite of my Dad from his youth, which is still great today! As ever, the detour was worth it! Jen drive the second stint from Musselburgh, down the east coast on the A1 and across the border to England. This part of the country is often skipped by more direct routes, but looked absolutely stunning in the sunshine. I then took over for a double stint to get us to Scarborough, via the Tyne Tunnel, Teeside and the North York Moors, where the photo above was taken. Although not quite as impressive as the Scottish Moors, it was great to see the moors in the glorious weather we had yesterday. Much better than our previous visit in the MR2, where we could just about see the end of the bonnet. It was slightly disconcerting to see the sheer drop to the side of the road, which we hadn’t been able to see in the fog last time! In Scarborough we met up with Jen’s family and celebrated her cousin’s 50th birthday at the local cricket club. Distance so far: 1182 miles. 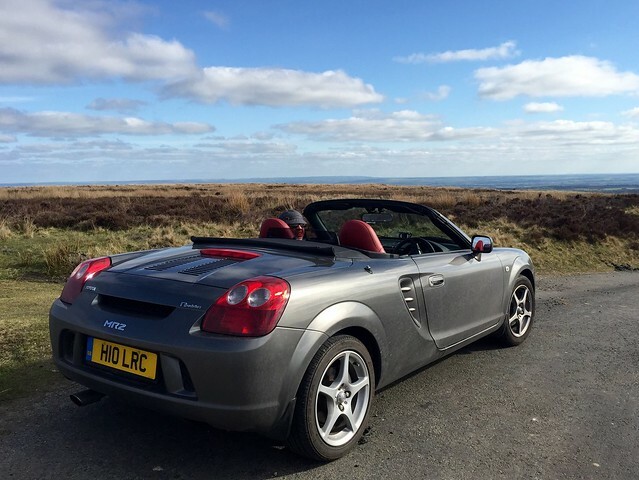 This entry was posted in Roadtrips and tagged iPhone, MR2, MR2 roadtrip, Photo, Roadtrip, Scotland, Yorkshire by Lewis. Bookmark the permalink.